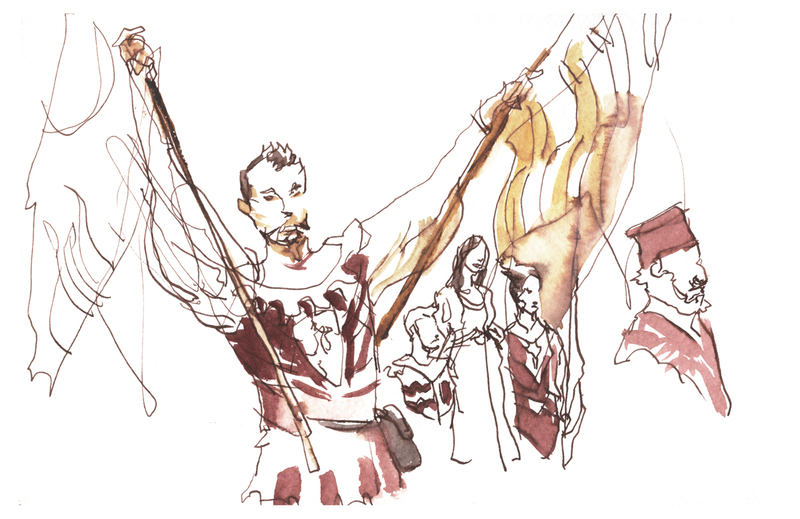 Sketching People in Action at the Cortona Flag Tossing Festival : Repost with real scans! 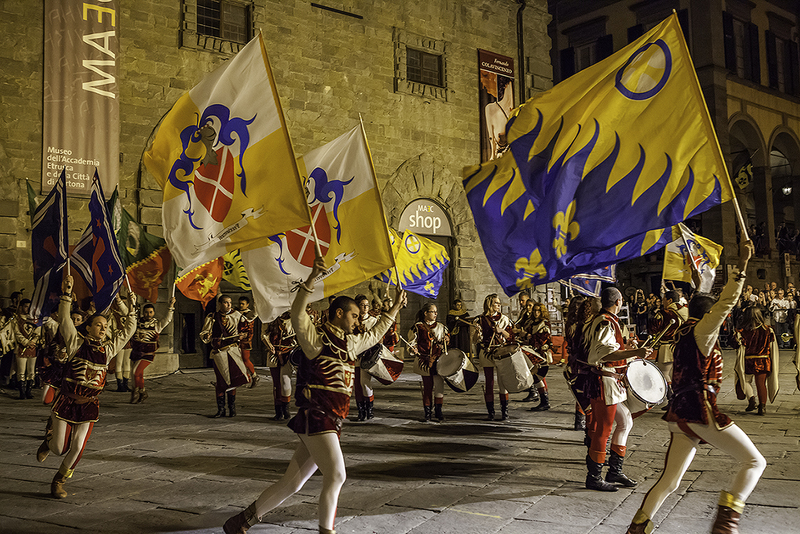 During this summer of 2015 we were in Tuscany on a painting expedition that happened to coincide with the Cortona Flag Tossing Festival. This event is a festival of color, a patriotic display, and athletic competition rolled into one. We were there for a week of plein-air painting, but some of us took the opportunity to take in the action with a small sketchbook. I had blogged about the event on the day using cellphone photos – but we’ve finally found some spare moments to make real scans, so we’re able to bring it to you again with real color and sharper images. Before the Flag-Tossing Teams marched in to the sound of trumpets and drummers, there was kind of a pre-game show. A troupe of medieval minstrels played bagpipes, and a team of falconers showed off their birds. The crowd started to gather – a mix of tourists in stands and the local citizenry coming out in costume to support their teams and be part of the show. 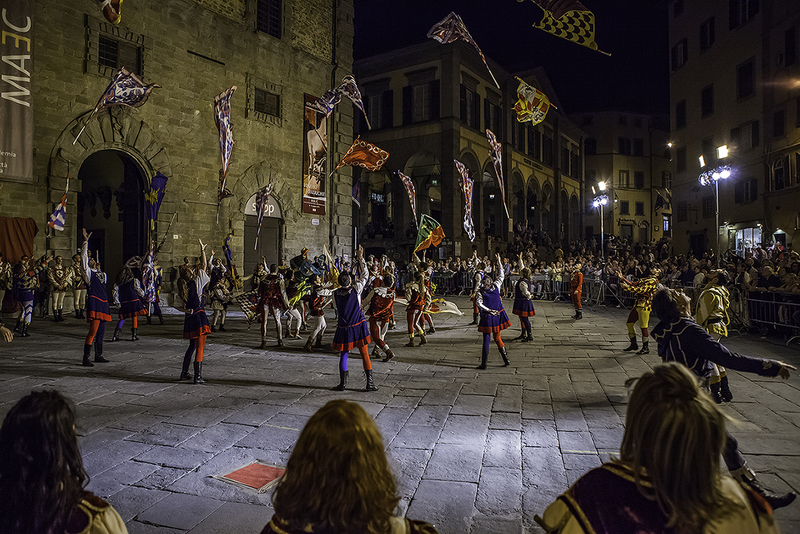 The flag event was the culmination of a three day historic festival including a crossbow competition and a recreation of a renaissance wedding – which I think was an important alliance between Cortona and a neighboring town. 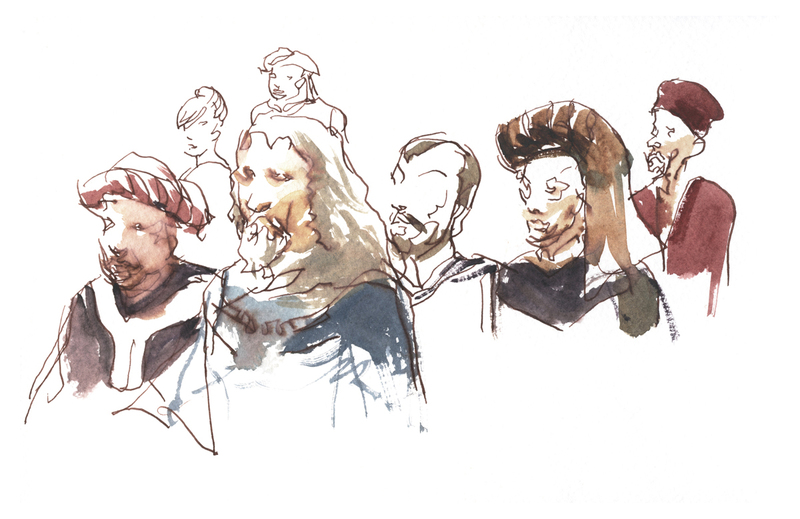 The cast of the recreation are all locals, drawn from the approximately 800 residents. Amusingly, the groom was played by a tall handsome gentleman who owns one of the local art galleries, and the bride by his beautiful daughter. 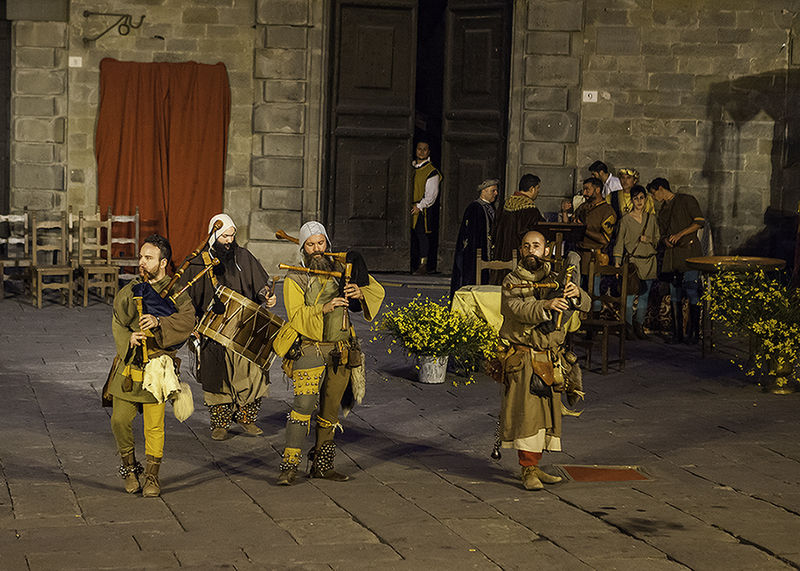 Earlier in the week we’d met the Cortona crossbow team. 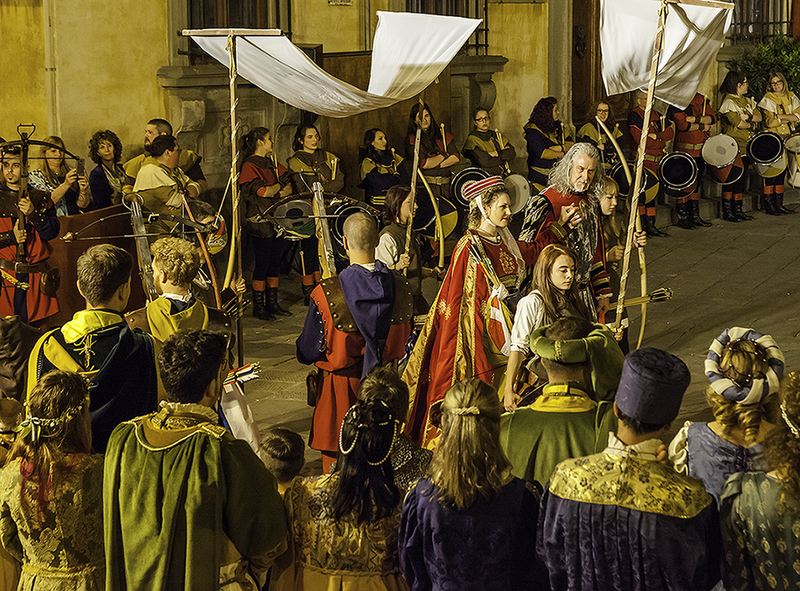 They were out early in the morning taking practice shots at a wooden plank leaned against the doors of the towns basilica. That seemed a little odd to me, but they were having a good time and nobody was stopping them. You wouldn’t see that over here in the Americas! The flag tossing event itself was full of enthusiasm and intense competitive spirit. 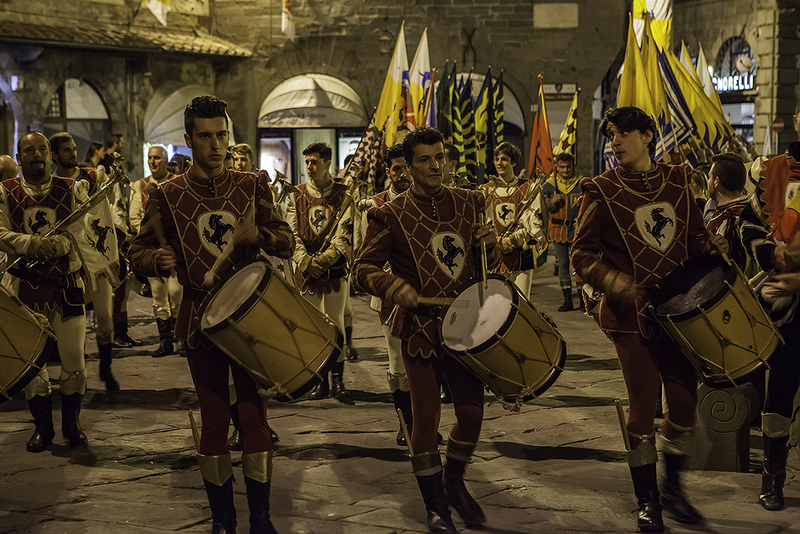 Each nearby town sent a delegation, their star performers marching in through a phalanx of crossed trumpets – like gladiators into the arena. 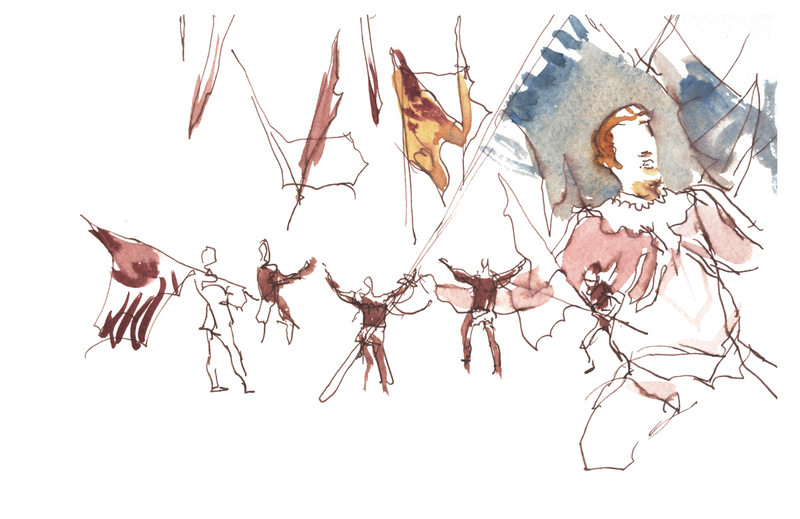 The event itself was a mix of tossers juggling flags 30 feet in the air while synchronized sprinters wove silk rivers of color around them. Every so often dueling pairs matched their talents in a kind of Kung Fu dance off. A squadron of drummers provided a dramatic martial soundtrack while flagpoles clacked like quarterstaves, whipped over ducked heads and below leaping feet. In the final spectacle all the teams ran a tight double spiral, filling the small square with upraised 12 foot flags, then peeling back out a huge iron studded gate. 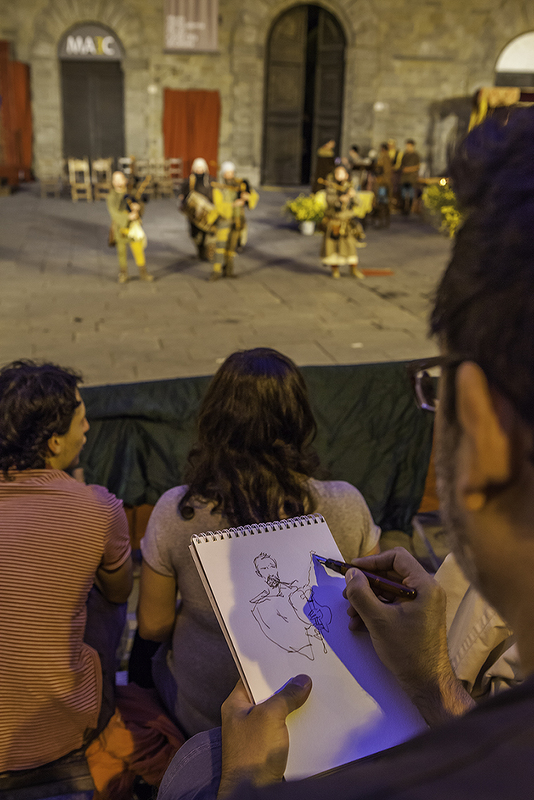 This night was a terrific unexpected bonus to cap our week of sketching in Cortona! Great! Your sketches look totally alive !!! I’d like to know what are the colours you used for the sketch of the young girl at the Atwater Market at our last USK meeting ? Hey Marc – that would be: Perlyne Maroon for the skin, Bloodstone Genuine. Transparent Red Oxide and Quinn Gold Deep for hair and a touch of Cobalt Teal on the nape. If you try the Perlyne Maroon watch out! It’s very strong! Marc these are wonderful. Such energy and atmosphere! I loved the drawings you posted before, that you said were taken with a phone camera, but of course I can see these are better images. Could you sometime consider a post giving some tips on scanning drawings? I have just tried to scan a sketchbook page that I’d previously photographed, but every time I do this I end up with results that are much worse than what I shoot with a camera. Perhaps I just have a dreadful scanner? (It’s an inexpensive Epson. I admit I have never understood much about how to use it.) Thanks. Thats odd, usually a scanner is nicer that a photo. Maybe look for a menu setting for photo rather than text to get a better image. I have an epson as well (older model tho). I press my sketchbooks flat with a stack of books to flatten the spine. If the book is larger than the scanner I do it in two or three chunks and auto-merge it in photoshop. it is a bit technical yes. I’ll try different settings. Part of the problem may be that the lid doesn’t have an expanding hinge and I often can’t close it, so I black it out using a blanket. Thanks. ah yes. On mine the lid comes right off. so I can lay the books over the edge. I don’t black it out tho and have never had a problem, as I’m cropping everything outside the picture. Really love how the figures seem to leap out of the page. Thank you for sharing! Super sketches…did this a couple of weeks ago at a local art festival and am definitely hooked…hoping to do it tomorrow at the Greek Festival and the Hispanic Festival…so much sketching fun and so little time!! 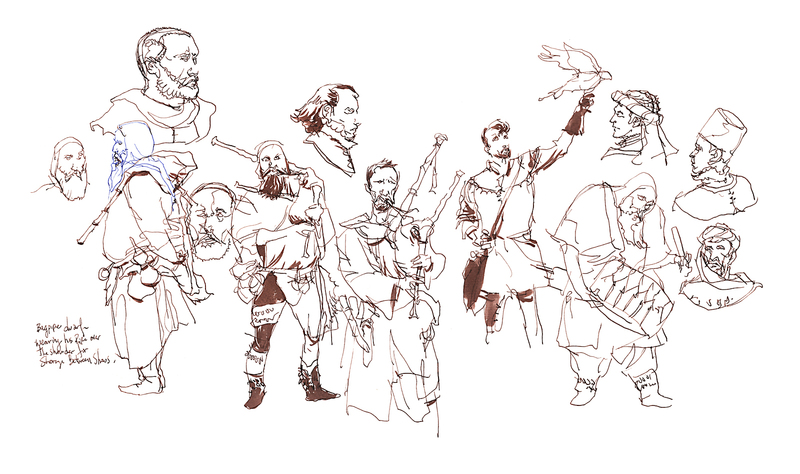 That’s real dedication to your art: going back 700 years in a time machine to make some sketches. That’s what it looks like, anyway. The photographs of the festival made for an interesting comparison. I’d love to see the pairs in their medieval version of a kung-fu dance-off. It sounds intriguing. 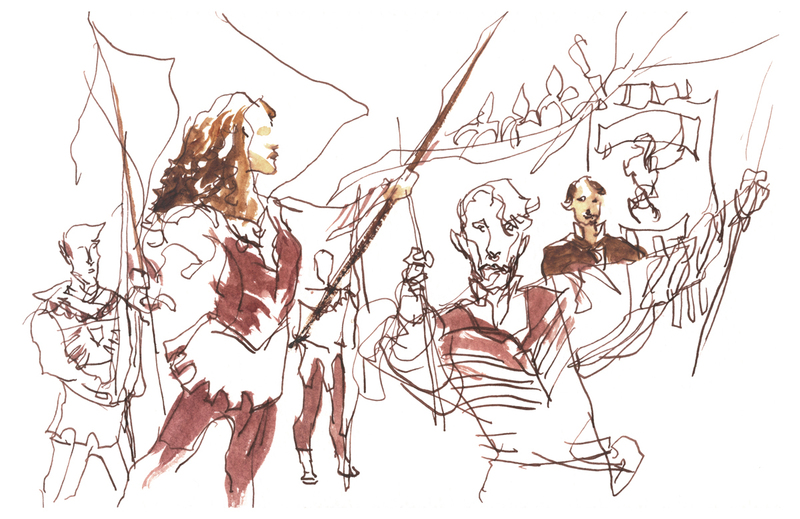 Terrific, lively, and energetic sketches, as always! But I’m also struck by the photographs, especially the first one. I had a moment when I couldn’t tell if it it was a photorealistic painting, a staged photo, or a retouched film still! Amazing camera work. 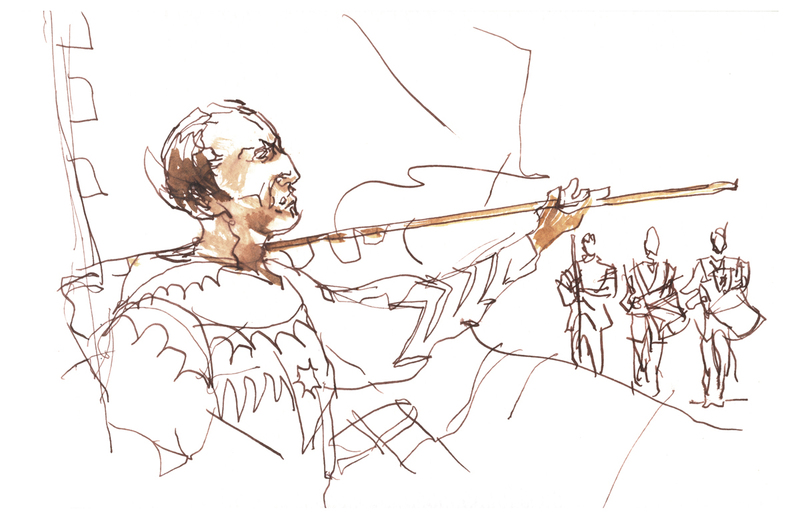 This experience reminds me of our first day in Florence (before I began sketching, alas) where we were fortunate to see and participate in a period drama of the Medicis with an entourage of 300-400 people walking in a parade through the narrow streets towards the Duomo, all in period costume, and including many musicians and flag throwers. Such artistry. A sight to behold.